Nahema was bred in 1991, a French introduction, large blooms. Won the Silver Medal, Fragrance, Gifu in 2006. Pink Mermaid produces large single flowers with a very heavy first bloom each year. Pink Perpetue was released in the U.K. in 1965. If you want a repeating climber this rose should be given your consideration. A 1957 introduction this variety offers large blooms and an upright climbing growth. The foliage is glossy and dark green. Fruity fragrance. 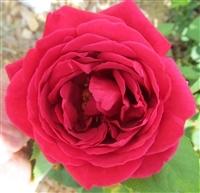 Rosarium Uetersen was bred by Kordes and has a light apple fragrance. It is also known as Seminole Wind. Introduced in 1959 this rose produces large and very full flowers. Shade tolerant. Winner of Dowager Rose Queen in numerous rose shows.